The main thing my husband wanted to see in London was London ... as Sherlock Holmes saw it. So our first move, like any fan of Sir Arthur Conan Doyle's creation was to take a double decker bus to Baker Street. As it turns out I read the map upside down or sideways or maybe it was backwards but we found ourselves in Putney at the bridge. Very much in the wrong direction. Over half an hour by car, which we didn't have. We wound up taking the tube back in the right direction which delivered us to the Baker Street Station. 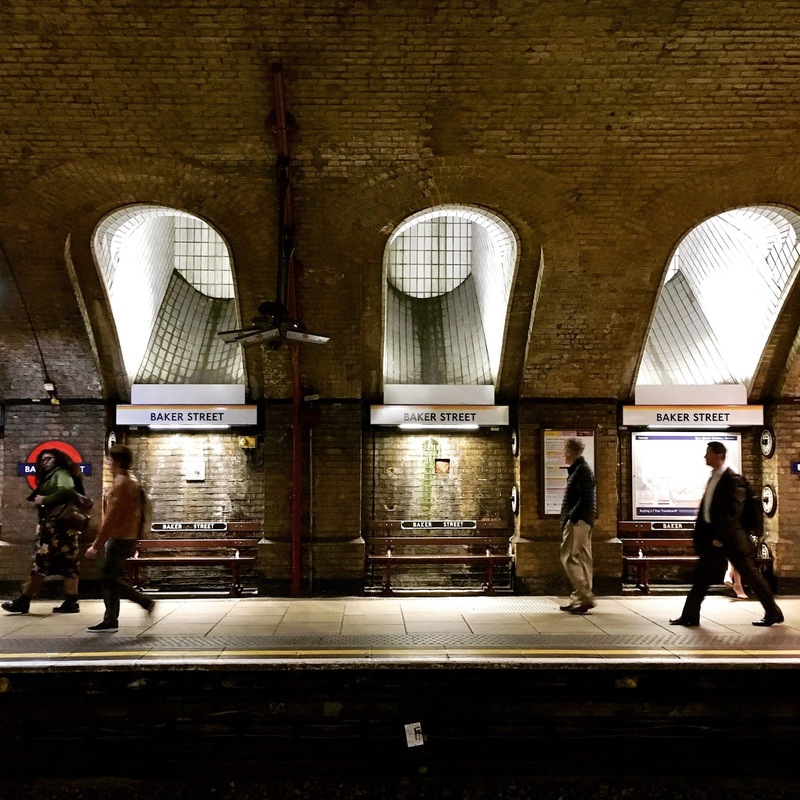 The station is one of the original stations opened when the Metropolitan Railway—the world's first underground railway—was built in 1863. While we don't immediately think of Sherlock dashing out on the tube, he very well could have and in fact the rail, train etc is alluded to in several dozen Sherlock stories. The Baker Street station is situated on the very block where Sherlock lived at 221B Baker Street. Or should I say the fictional 221B Baker Street created by Sir Arthur Conan Doyle for the world famous detective. 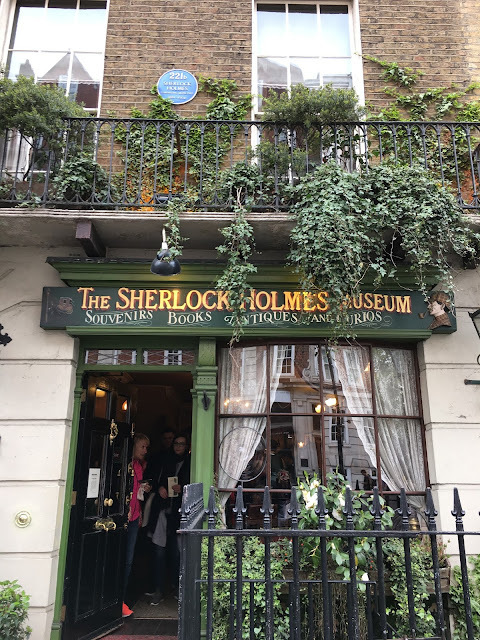 A purist, my husband would do little more than poke his head in the gift shop of the Sherlock Holmes Museum, reminding me yet again that there was no such place as 221 B Baker Street, it was a creation from the mind of Arthur Conan Doyle. It's his opinion that those who put the place together, selling all kinds of trinkets, were simply making a pile of dough and profiting off Holmes legions of fans. Notice the sign above the shop/museum? The first word is Souvenirs. 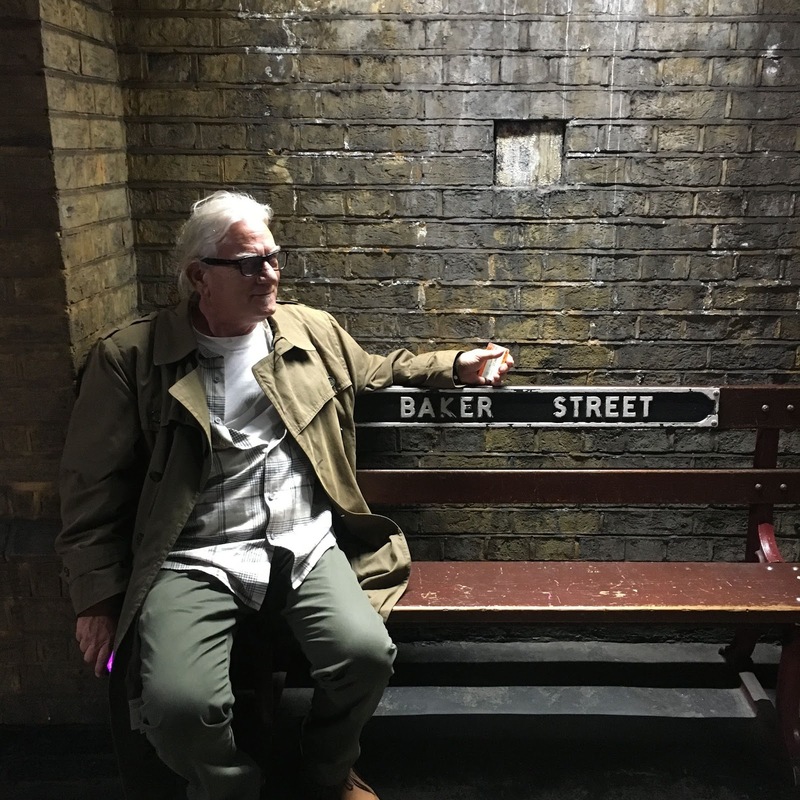 My husband at the Baker Street station perhaps pondering the presence of Sherlock Holmes' ghost. "Come Watson, come! The game is afoot!" Wonderful! I think it's great (as in 'amusing') that we make visitor attractions out of fictional happenings. ACD got married down the road from me though - I really should do an article about it one day! Yeah, he's a bit of the old stick in the mud about it. Yes, Mike, write that article! I got a kick out of the Baker Street station, expecting Sherlock Holmes any minute. But, actually, I was there as part of a tour of the Underground and I learned a lot about the early days of the Tube. Oh nice! I think it's one of the loveliest looking ones we saw.